2007 has been one crazy year for us at Ekset. Moving the corporate offices to Portland, OR was an awesome move for us and its definitely going to help things progress. We have been hard at work on promotions, continuing to support Resident Hero, Putnam Hall and also a lot of great coverage in the tuner car scene with the Teske Design project Scion tC. The Ekset skate team has seen some changes. We still strongly support Meng Tea, who has relocated to Atltanta, GA and now has more skate time with the east coast riders repping the brand and has a part in the Gator video. Harry Chippas is now focusing more on filming and killing it, with footy in the latest Gator Boardshop Video. Bobby Dodd is also still skating for Spirit Skate Shop and making rounds in the Northwest. Much of our new progress has been through our support in the music and tuner car scene, which has been great. Also, thank you to all of you riding and repping the gear both on the street and mountains! 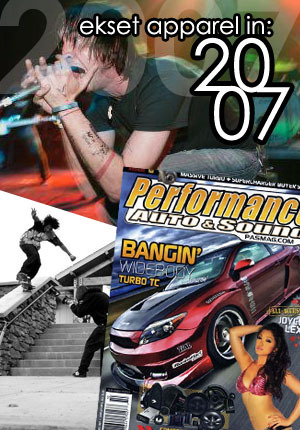 For 2008 we will be releasing some new designs that we stoked on. Keep checking back for further updates and be sure to pick up on the HOLIDAY SALE! !